The Japanese word Wagyu translates as “Wa” meaning “our” or “Japanese” and “Gyu” meaning “Cattle”. Although the name Wagyu refers to all Japanese cattle, it has become synonymous in the USA with Japan’s famous Kobe or Tajima Beef. Kobe is the capitol of the Hyogo region of Japan which is in the ancient Tajima province where selective breeding as well as traditional Japanese handling and feeding of Waygu cattle has resulted in the finest and most expensive beef found anywhere in the world. The marbling, flavor, color and texture of Wagyu beef makes for an incredible culinary experience, and in this case what’s incredibly good to eat can be better for your health than any other beef. Wagyu beef tends to have a 2:1 ratio of monounsaturated fat (the “good” fat) to saturated fat (the “bad” fat), a much better profile than any other breed of cattle. Even the saturated fat in Wagyu is different from that other cattle. 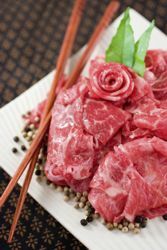 Forty percent of Wagyu saturated fat is stearic acid which is known to have little impact on raising human cholesterol levels. 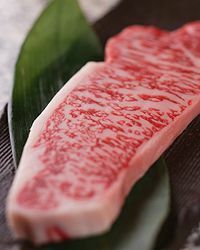 Wagyu beef is also unique in its high concentrations of beneficial omega 3 and omega 6 fatty acids. The Wagyu cattle capable of producing beef of exceptional quality are in heavy demand and are sought after all over the world. Our full blood Wagyu seed stock is the product of some of the most proven carcass genetics to enter the United States and our percentage Wagyu derive from crosses with our Registered Angus that we have bred and selected specifically for desirable carcass qualities. Color, luster and quality of fat and identifies damaged or blemished carcasses. In the United States our USDA Quality Grades do not even have a classification high enough to identify beef with such abundant and well distributed marbling as is afforded by properly bred and handled Wagyu cattle. The American Wagyu Association is currently working on setting standards for the USDA to allow for recognition of a Certified Wagyu Beef brand to identify Wagyu beef that performs outside the scope of the antiquated and vague USDA system. * There are no official grades above Abundant in the USDA specifications. The terms Very Abundant and Extremely Abundant are arbitrary.